RENTED/LEASED $1,450.00 Yearly Gorgeous & Sparkling Clean! Bathrooms: 1 "Beautifully updated w/quartz vanity!" Adorable 2 bed, 1 bath beautifully updated main floor apartment with private entrance in an extremely well-maintained, quiet, smoke-free/pet-free triplex in Lowertown. Large eat-in kitchen/dining, w/2 bedrooms & den/LR. New wide-plank flooring, stunning new bathroom tile flooring, subway tile backsplash in kitchen, new stainless appliances, sensational new bathroom vanity with quartz countertop...new shower/tub/liner...all sparkling and new for you to enjoy! Convenient (and totally cute) main floor shared laundry. Cozy and warm, with remote controlled ductless AC. Beautifully landscaped and well-maintained building. Short walk to the Byward Market, DFAIT, Ottawa U, great shopping (Loblaws, Drugstores, Starbucks, etc.) and public transit. References required with first/last month rent. 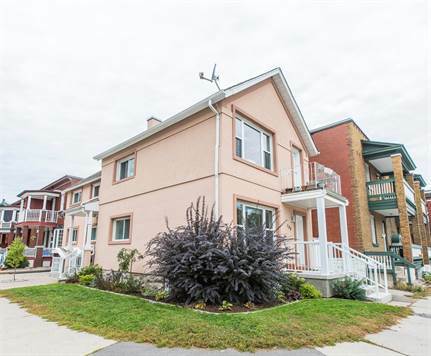 Call today for a viewing @ 613-852-3243. Available Dec 1st, 2018. $1450/month + hydro (heat included).